This large beach tote bag can carry your towels and swimsuits at the beach, keep your snacks fresh and drinks cold. Ideal for beach, picnics, camping, swimming pool, road trips, BBQs, vacations etc. Built-in Insulated Cooler is big enough to fit a 12-pack of cans and two outside pockets were an added bonus for quick access to things for valuable phone,wallet etc. Never worry about your mesh beach bag get wet when the ice melt or water. The insulated bottom keep sodas and waters and all kinds of stuff warm or cold. Our mesh is fast drying perfect for wet towels and swimsuits and easy to shake off sand. Made of extremely sturdy material, quick-drying. 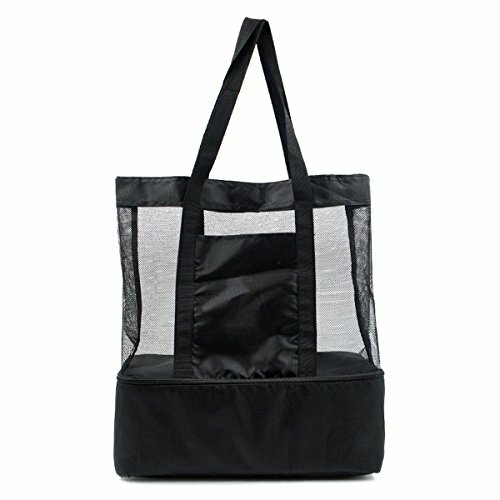 Premium Material: The beach mesh bag is made with durable nylon and dense mesh, it is tear resistance, to take anything you need for a day at the beach or swimming pool, camping site. Lightweight & Breathable Mesh Construction: The on top breathable and roomy mesh beach bag compartment easy to access your beach essentials quickly, enjoy your beach vacation with cold drinks. Insulated Cooler Bag: Featuring an additional insulated cooler bag section with an easy to clean flexible soft liner, perfect for keeping your food and drinks cool and fresh. This picnic cooler compartment bag is ideal for parents. Large Capacity: Size 16.5*15*5.5in (42*38*14cm) / 170g (6oz), the mesh beach bag is large enough to contains towels, toys, drinks, food etc. External extra pocket for glasses, sunblock, keys, phones etc. Multi-Function: 2-IN-1 beach bags, Good for the beach, parks, picnics, BBQ's, camping, travel etc. If you have any questions about this product by Buruis, contact us by completing and submitting the form below. If you are looking for a specif part number, please include it with your message.